Since turning 1 a little over a month ago, Baby Bird has been fascinated by books. We’ve been reading to her since she was born, but just recently she started taking an interest in them; turning the pages and looking at the illustrations. I was so excited to receive 8 books and a doll to review from Clay and Katie. Baby Bird was pretty happy too! Clay and Katie was born from the creative mind of Anna Narday, a Riverdale resident in Toronto, Ontario, Canada. She grew up in a Hungarian family as the youngest of four children and the only girl. Writing children’s books has always been a dream of Anna’s. Using her artistic and graphic skills, she was able to create very simple and colourful images along with two loving characters – Katie and Katie’s friend Clay. These books are a great transition between board books and paper pages. The pages are thinner than the board books, but can not be easily ripped by little hands. This is great to have if your little one is independent and likes to show you they can hold the books on their own, like Baby Bird does. My favorite book is the ‘Days of the Week’. The book goes through a week in Katie and Clay’s life. Each day has them doing something different. As you go through the days it asks the reader to remember what happened during the previous pages. All of the books communicate to the reader in this way. You can also have your very own Clay doll for your little one to hold and play with as they read (or hear) about all of the great adventures that Clay and Katie go on. The doll is about 8.5 inches high and is made of a soft plaid flannel and terry cloth ears and tail. Baby Bird loves it when I stand Clay up on his own across the room. I enjoy watching her as she moves across the room determined to knock him over. Not only are the books and Clay doll fun, but the website is interactive too. You can send in your picture of Clay as he travels all over the world and it will be displayed on their website. Where would you take Clay? 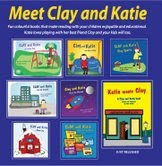 You can purchase the Clay and Katie books online. We are taking Clay to Philippines!! We would take on bike rides every day. I would take him to the trees near our house. We're planning a cruise to Panama in January so that's where Clay would come with us – to Central and South America. I would bring Clay to Western Canada (yeah, our own backyard)! I would take him to Jamaica!! I would take Clay to the children's museum here in wpg. I went there last week with my stepson and my neice and it was amazing how much fun they had! the whole day was full of squeals of excitement. We would take Cody to Hawaii with us next summer and take him to the top of Diamond Head or one of the volcanoes… Maye even teach him how to surf! LOL! !